Our straw hats are like no other! We don't use that heavy stiff straw, but instead a thin, soft and very flexible braid that is avaiable from us in a wide variety of colors. This braid hat has a tall crown and medium brim. It is trimmed with ribbon roses, loops of lace and a perky tuft of peacock plumage. To coordinate, we have included a lovely 1/12 scale shopping bag and matching box. All artwork is from my 1912 La Mode magazines. They are so cute you will want to make a dozen!!! Download is in PDF format. 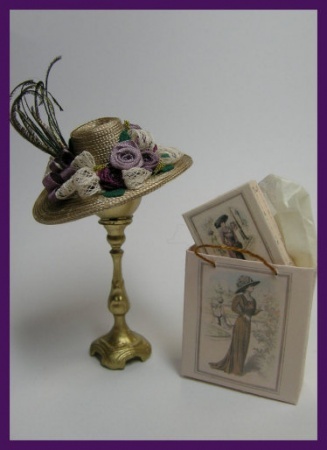 It contains complete instructions with dozens of photos, full size pattern pieces for the hat, and full color artwork for the box and shopping bag.